The Navajo Generating Station provides the majority of the Central Arizona Project's power. The Central Arizona Project, a legislated municipal water agency that provides water to 5 million Arizonans, voted on Thursday to receive some power from a new 30-megawatt solar installation. 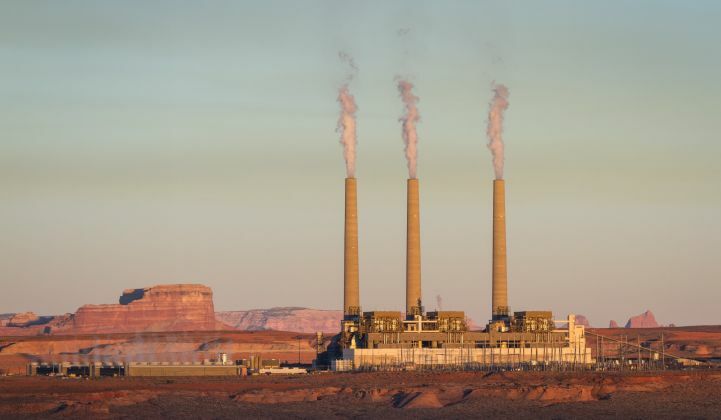 Its main source of power, the coal-fired Navajo Generating Station, is set to close in 2019. The 20-year power-purchase agreement with developer AZ Solar 1 would provide power at $24.99 per megawatt-hour for its duration, starting December 31, 2020. That price brings the project within striking range of the most competitive in the country, but also offers plenty of time for system costs to drop to those levels. GTM Research senior solar analyst Colin Smith said the Central Arizona Project (CAP) deal marks the second-lowest solar PPA in the GTM database — behind an Austin Energy project announced in December that may hit $21 per megawatt-hour. But there is still some price ambiguity around the Austin project, making the Arizona water agency's agreement the lowest confirmed price to date. The swap from coal to solar is also in line with expectations of where the energy industry is going. Last year, renewables accounted for nearly half of new capacity additions in the U.S., with solar leading the way. But the ties between CAP’s pivot from coal and the federal administration’s attempts to keep the industry prosperous means the decision is wracked with controversy. Last week, Assistant Interior Secretary Timothy Petty sent CAP a letter that said the secretary has “governing authority” over the project’s power source and suggested that might require CAP to offtake NGS coal power. Petty oversees the Bureau of Reclamation, which is a partial owner of the Navajo Generating Station (NGS). CAP was created through federal legislation, the Colorado River Basin Project Act of 1968, which authorized the creation of several water development projects and designated CAP’s water delivery authority. CAP uses power from NGS to pump water from the Colorado River to users in several Arizona counties. CAP said they interpreted Petty’s letter as “asking questions, not issuing mandates” and will continue to work with the Interior Department to discuss the future of NGS. In the Thursday meeting, board member Lisa Atkins noted that "CAP is not required by law to buy NGS power." She also added that the project is not at war with coal, but seeks a "long-term, cost-effective, reliable and diverse power portfolio" for its water users. The coal plant also has tribal ties, as both the plant and the mine are located on tribal land. Leaders from the Navajo and Hopi Nations have lobbied to keep the plant open, arguing its closure would be “catastrophic” and plunge workers and communities into dire economic straits (the Hopi Tribal Chairman has also said if the federal government hands over the 144,000 acres it promised to the Nation back in 1996, it would help mitigate these impacts). The Hopi Tribe, Peabody Western Coal Co., and the United Mine Workers of America recently filed a lawsuit against the Central Arizona Water Conservation District, which has authority over CAP. It asked the court to require CAP purchase power from NGS while it remains open. The suit also claims there are buyers interested in taking over the plant from current operator, the Salt River Project (SRP). As the board prepared to vote on the change in resources, Joe Greco, senior vice president of asset management at Illinois-based Middle River Power, said the company was preparing a plan to buy the plant. SRP spokesperson Scott Harelson said that though the utility signed 16 nondisclosure agreements with potentially interested parties several months ago, none have resulted in concrete offers or even negotiations. If a buyer does materialize, the Thursday agreement doesn’t necessarily preclude CAP from purchasing NGS power in the future. The solar plant, in addition to a five-year PPA with the Salt River Project also approved Thursday, will only provide 14 percent of the project’s power. NGS currently provides 70 to 75 percent. But, if current price trends continue, CAP may not want to. While the solar power from the new plant will cost about 2.5 cents per kilowatt-hour, estimates indicate the coal power from NGS costs double at over 5 cents per kilowatt hour, according to Eddie Burgess with Strategen Consulting. Michael O’Boyle, electricity policy manager at the clean energy advocacy and research organization Energy Innovation, calls the vote “quite a modest overture into clean energy.” But he added that the phenomenon of solar beating out coal is unlikely to change. “These incredibly low costs show the default presumption for new resources in Arizona should be solar,” he added. According to CAP's Person, the project has already delayed some decisions related to its request for proposals to allow more time for the future of NGS to clarify. But 2019 is fast approaching, and the solar project and the SRP PPA were all time-sensitive, she said. With the board recessing in July, more decisions on CAP’s future generation mix could come in August.